China is one of the 12 mega-biodiversity countries in the world. The main ecosystems in China include both territorial ecosystems (e.g., forest, shrub, meadow, steppe, desert, wetland) and major marine ecosystems (e.g., the Yellow Sea, East China Sea, South China Sea). 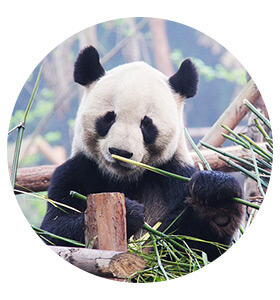 Perhaps half of China’s species are found nowhere else; these include many archaic and distinctive evolutionary lines, such as the Giant Panda and the Ginkgo tree. for only 21 % of its area, rangelands are severely overgrazed, wetlands are rapidly shrinking, and invasive species are an increasing problem. China understands the importance of biodiversity conservation and is committed to the goals of the Convention on Biological Diversity (CBD). The CBD COP 15 will be hosted by China in 2020. Germany has been supporting the activities of the CBD for a long time. The Sino-German Environmental Partnership supported its partner, the China Council for International Cooperation on Environment and Development (CCICED), during the CBD COP 14 in Sharm El Sheikh/Egypt.